Educators probably make hundreds of choices every day. What do I attend to? How do I balance my instructional goals across the curriculum? Which children should I be working with right now? What should I purposefully ignore? It can be overwhelming and sometimes the relentlessness of the classroom environment leads to inertia. We start making fewer and fewer teaching moves so as not to have to make a choice. That too is, of course, a choice. The story of these choices becomes how the year unfolds and how we all, students and educators alike, experience being part of the classroom community. Our choices have an impact, whether we’re being thoughtful about them or not. Many times, especially in early learning, those choices come to us serendipitously and we have to react in the moment, deciding which threads to pull on and which to drop. Here’s the story of one of those threads. 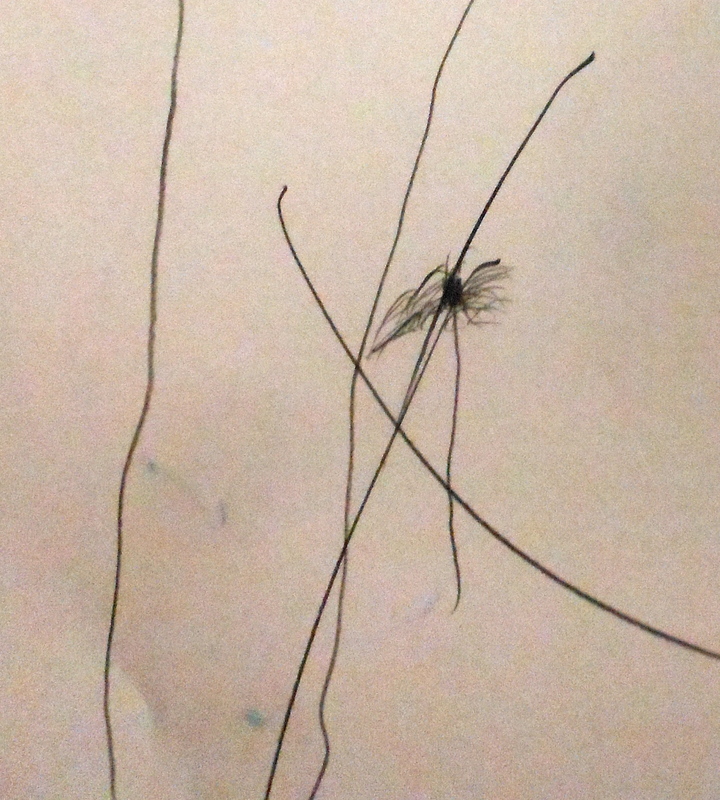 I was visiting a classroom recently when I noticed a child drawing a spiral. 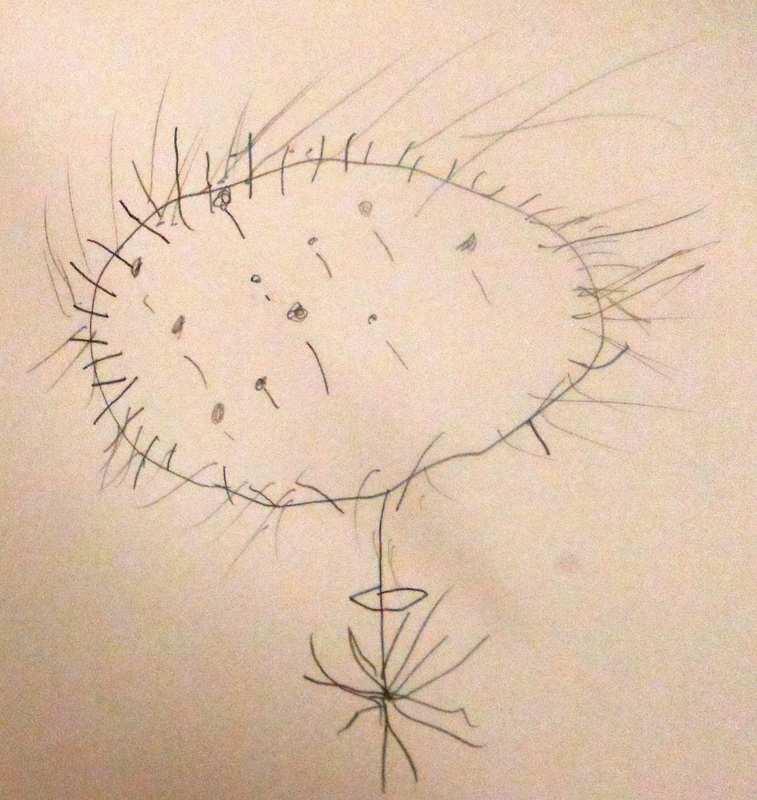 I asked him about his drawing and he initially didn’t have a lot to say. In my best Doug Clements imitation, I introduced the vocabulary of a “spiral” and asked the child where he had noticed shapes like that before. It was then that serendipity struck. I recalled that earlier in the day another child had asked the classroom teacher about the contents of one of the boxes on a shelf and she had replied that it contained shells that someone had donated. I wondered if there might be a spiral-shaped shell in that box. We went to look and found that there were several large conch shells in the box. This discovery inspired the usual listening to the ocean sounds but once we’d all had a good listen, we went back to the table where we’d started and I challenged the children to draw the spiral shapes that they observed in the shell. G, the child who had drawn the original spiral, struggled to capture the details in the shape of the shell while maintaining the spiral shape. When he reached the edge of the paper, he declared that he was “done”. I wanted to know how he knew his drawing was finished. His friend and I had also been drawing the shell and we looked at how all three drawings were different from each other. We also noticed that R, another child at the table, was drawing a different shell and was paying close attention to the detailed lines on his shell. I wondered aloud whether some magnifying glasses might help them look closely at the shells so that they could all do what R was doing. We fetched the magnifying glasses and G made a second attempt at drawing the conch shell. 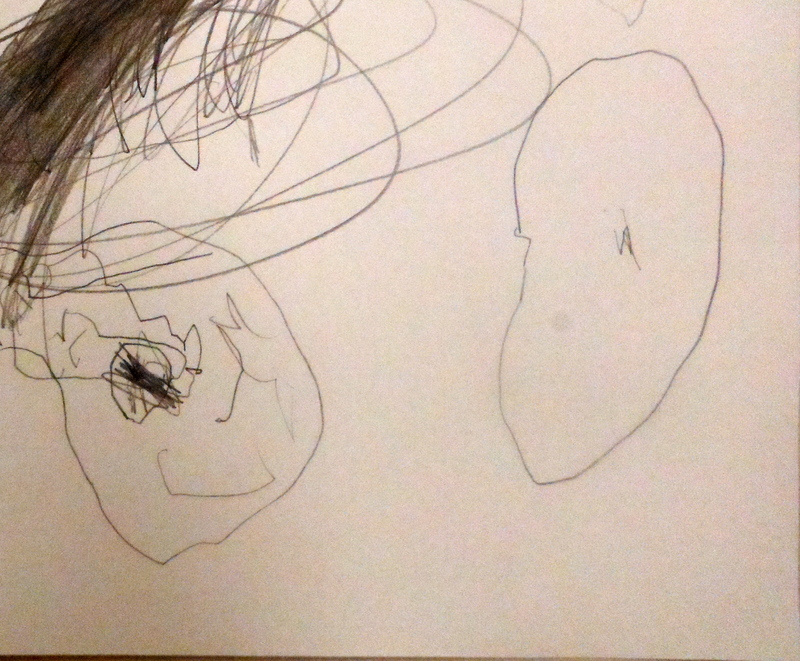 This time, G looked very carefully at the shape of the shell and followed with his eyes as he drew. He drew more slowly and paid close attention to the details. He frequently paused to change the angle of the shell on the table. 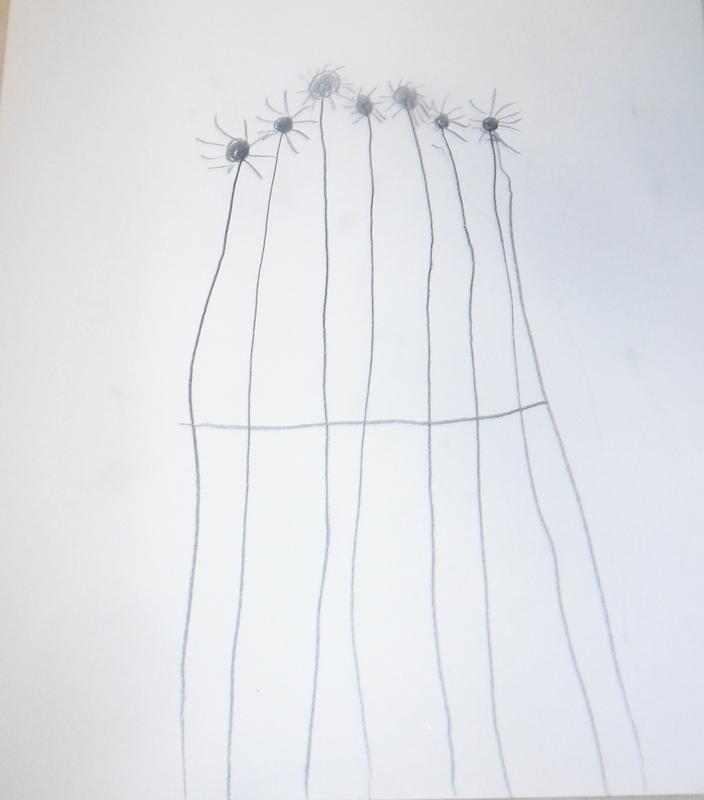 When the class gathered at the carpet, we shared with the other children our drawings and our learning about the shapes we had found in the shells. We also shared the new vocabulary we had learned: spiral. The inquiry might well have ended at that point as the students went to eat lunch and then moved outside for their outdoor play block but serendipity struck again. As I was wandering around the edge of the schoolyard, looking for places that the class might explore and engage with nature, I noticed that some of the terrain had been disturbed by a piece of heavy equipment. Soil was turned over, it was muddy and snowy and there were tire tracks everywhere. When I walked over for a closer look, I noticed some small objects sticking out of the ground. Amazingly, they were snail shells, dozens of them. Some were broken but many were intact and they were all covered in semi-frozen mud. I called the children over and they began plucking them out of the ground with their cold fingers. The students who had drawn the shells earlier in the day were particularly excited when they noticed the obvious spirals on the snail shells. We theorized about what the broken shells would look like once we washed the mud out of them and the students debated intensely amongst themselves: were there snail guts in there or was it just mud? I had to leave the school at that point but I left them with the shells and a plan to wash out the mud and report on what they observed. I also sent them a copy of the book Swirl by Swirl: Spirals in Nature by Joyce Sidman. There’s a lot going on here: children are investigating concepts that, in a traditional academic context, would slot themselves nicely into the subject boxes called Biology, Mathematics and Art. For children, these are a whole. Finding that context and being open to the serendipitous choices that are available to us every day depends on how well we listen to kids, how closely we watch them and how much we care about creating curriculum that is relevant to their holistic way of seeing the world. 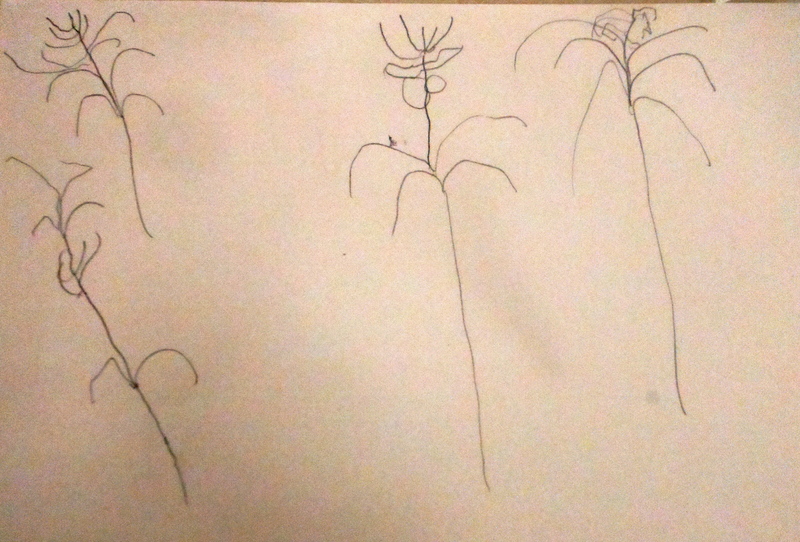 Children can draw from observation. They have an eye for detail and they can reproduce those details with remarkable accuracy. Even very young children, only just able to hold a pencil, can draw the concentric petals of a rose or the long lines of stalks of grass. 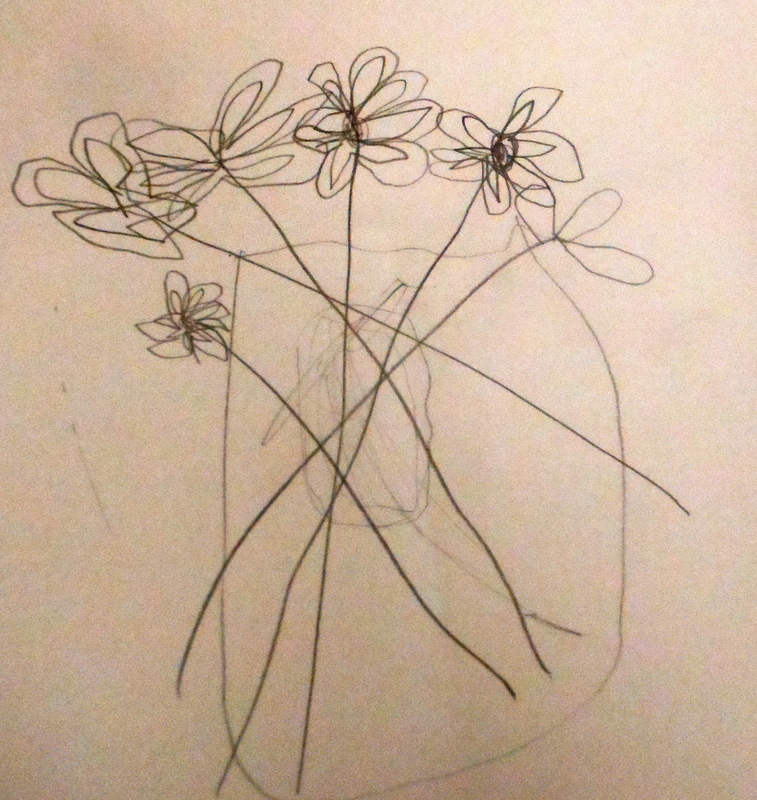 But what happens when children forget that they can draw? When they insist that they can’t? 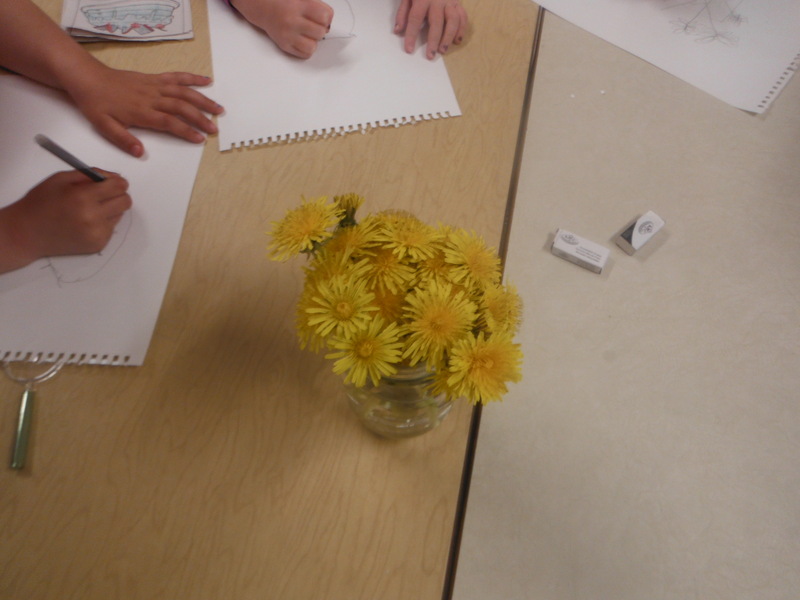 I’ve trucked out my usual strategy of sitting and drawing with them; perhaps they’ll realize that Madame’s flowers aren’t perfect representations either and maybe watching me struggle will encourage them to try. I’ve put out the work of a variety of artists whose work ranges from representational to abstract, hoping that it might encourage them to try a new way of drawing. 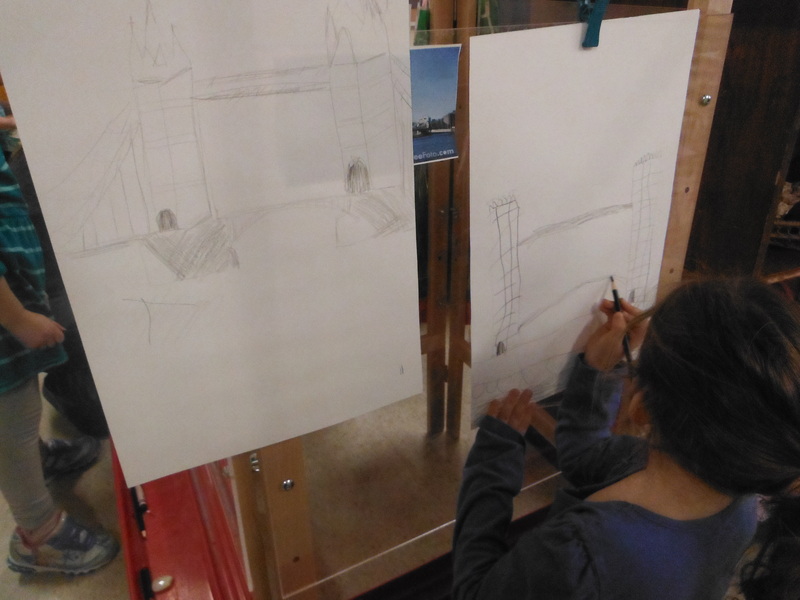 We’ve even had group conversations about the mechanics of drawing what you see – moving your eyes and hand together to draw. Unlike other years none of these strategies has met with much success. While a few individual students have been engaged, the idea has never really caught on. But I’ve kept at it and finally, in the last month of school, victory! What’s the magic? Was it the subject? 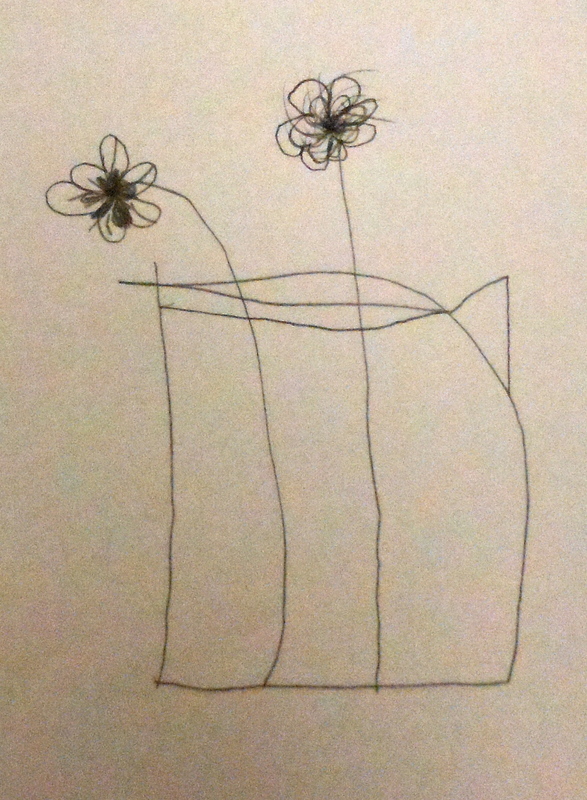 Maybe dandelions, that most common of flowers, is less intimidating than roses, faces, and block towers? Maybe it’s just time having its often miraculous effect. Maybe it has taken a year for the cultural message of sameness and cuteness to be washed away and for the children to realize that their own representations, however different from each other, will be valued as much, more even, than any smiley face. Wouldn’t it be great if they didn’t have anything to unlearn? If their interpretations were always valued? If we allowed the aesthetics of childhood to exist without needing to modify them to suit our own adult ideas about what childhood is? Wouldn’t it be great if children’s interpretations of the world were as precious to us as the motifs that the media presents as childhood for sale? That would be a smiley-face moment.